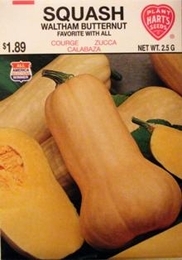 An excellent strain of butternut developed by the Waltham Mass. Ag experiment Station. Skin color is a creamy yellow and flesh is a deep golden orange. It's seeds are few and all are located in the middle bottom. Can be served either baked or boiled, its quality is exceptional, entirely free of stringiness. Allow the fruits to remain on the vine until fully matured. Handle carefully and store in a moderately warm, dry place during the winter. Average Squash yield per acre - 8-10 tons.